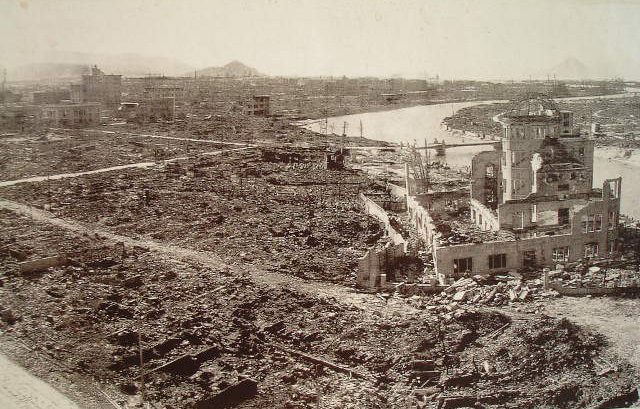 HIROSHIMA – Some might view Chizuko Wataoka as overly superstitious. Her refusal, however, for more than 60 years to pose for a family photo is rooted in terrible tragedy. Her entire family perished just days after their first – and only – family portrait was taken in August 1945 when Chizuko’s hometown of Hiroshima was leveled by an atomic bomb. Ever since, she has feared she could lose her loved ones again if she were to pose for another family photo. The original family portrait is kept by the altar of her home in Naka Ward, Hiroshima. It is sepia colored with age. Chizuko’s family decided to have a portrait taken as they prepared to evacuate the city as a symbol of their wish for an eventual safe return. Taken in the family living room, it shows the proud parents and their four daughters dressed in their best clothes. Little could they have known that Chizuko, the eldest child, would be the only one to see it processed. Chizuko, now 77, was orphaned at 16 on the morning of August 6, 1945. She and her 14-year old sister Kayoko both left the house at the same time. Chizuko set out for the canning factory where she worked as part of a student mobilization effort. Kayoko, who was sent to clear ground for fire control, was to die alongside some 700 of her classmates. Her remains were never recovered. The family home was only 750 meters from ground zero. The day after the bombing, and using what is now known as the Atomic Bomb Dome and the river as landmarks, Chizuko made her way to where her home had once stood. The house was gone. She scoured the debris and managed to pull out the blackened remains of her father, Shigemi, and her 6-year-old sister, Hirono. In the area that was the kitchen, she found the body of her mother, Mitsuko, lying among broken tiles. In her arms, Chizuko’s mother held her youngest child, Kimino, 3, as if trying to shield her. The two bodies were completely charred except for the tiny area where their breasts had lain close together. A small amount of fabric remained intact. Chizuko could pick out the flower print of the dress her little sister had been wearing that morning and she recognized the blouse her mother had put on. She held the pieces of cloth in her clenched fists and wept. She could not stop crying. A few months later, Chizuko was walking through the ruined city when she bumped into the photographer from the neighborhood photo studio. That was how Chizuko came to possess her family’s portrait. Taken in by her uncle after the war, Chizuko married at age 22 and eventually gave birth to two children. She and her husband worked hard to rebuild the teashop left by Chizuko’s father. Despite her later happiness, Chizuko still could not sit for family photographs. She was terrified it would bring back the grief she suffered on that fateful August day. “I knew in my mind that the photograph had nothing to do with my family’s death. But I longed to stay with my family for ever and ever.” And although the photograph is prominently displayed, Chizuko never told her children or grandchildren the story behind the picture. Finally, Chizuko relented. She decided to break her silence and tell the story she had kept locked inside her for so long. She paid a visit to her grandchildren’s elementary school, Honkawa Shoggako, the same school from which Chizuko graduated.